Combined digital manometer and pressure data logging instrument for recording pressures and temperatures that can store up to 57,000 readings in non-volatile memory with a battery life of up to 5 years. The LEO Record Pressure Recorder includes a digital pressure gauge to display a continuous pressure reading to an accuracy of 0.1% full scale. For hazardous area applications requiring intrinsic safety, the LEO Ei pressure data logger is IECEx and ATEX approved for use in potentially explosive atmospheres. The data-logging function of the LEO record is set-up with the Logger configuration software which is compatible with Windows for PC operating systems. The LEO record pressure data logger is a battery powered compact instrument which can store up to 57,000 readings of pressure and temperature in its non-volatile memory. Pressure testing does not necessarily require an elaborate data acquisition system with many input channels permanently connected to a PC. If the test is to be carried out in a intrinsically safe area a simpler approach becomes even more desirable. Often a single channel pressure data logger which can be easily moved around is a much more convenient and cost effective alternative, especially if it is also battery powered and intrinsically safe for use in potentially explosive atmospheres. For improved performance when leak testing it is useful to also record temperature so that pressure variations caused by adiabatic effects rather than leaks can be identified and excluded from the results to determine the true leak rate. 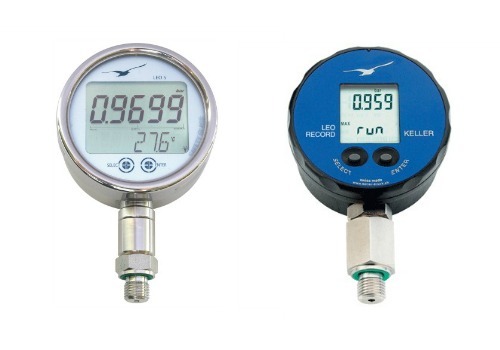 Pressure ranges from -1 to + 1 bar up to 1000 bar gauge or absolute are covered by the LEO Record pressure data logger and unlike other data loggers it has a built-in LCD digital readout for displaying the real-time pressure level and the data logging running mode. The pressure units of the LEO record pressure datalogger including bar, mbar/hPa, kPa, MPa, psi & kp/cm2 can be altered via the two front panel buttons which also control power on/off, zero tare and record start and end functions. The stored pressure and temperature readings are retrieved from the LEO Record pressure data logger via a USB or RS232 interface cable connected to a PC, Laptop or Pocket PC. All data logging parameters are configured using the Logger software which is supplied with the data communications kit. For pressure testing carried out in hazardous areas the LEO Record pressure data logger is available in an intrinsically safe version. The logging procedure is uploaded in the safe area via the USB or RS232 interface so that the LEO Record pressure data logger can then be transferred to the hazardous area to run the test powered by the internal battery. Once the pressure test is complete the LEO Record pressure data logger can then be returned to the safe area for downloading the test results. The LEO Record pressure data logger is powered by a SL-760 Lithium battery which lasts up to 5 years if 1 reading is recorded every 10 seconds or 2 years if 1 reading is recorded every second. The compact housing of the LEO record pressure data logger has an IP65 ingress protection rating allowing it to be used outdoors if necessary and there is an optional rubber boot protective cover to prevent damage if dropped. The reliability of water supply in remote and isolated communities can very significantly throughout the day. The LEO Record is used to measure water pressure fluctuations over a 24 hour period to profile how the pressure varies, in order to understand how changing demand and supply affects water distribution pressures. Continuous monitoring of cold water supply to hot water services calorifier make up tank. Log the mains water pressure being delivered to a building to check for fluctuations in supply pressure. Monitor incoming water pressure to determine whether temperature fluctuations are caused by changes in water pressure. Use a barometric pressure range to monitor and log laboratory ambient air pressure. Monitor and record the water inlet pressure on autoclaves which are used to sterilize equipment in hospital facilities. Record hydraulic pressure test data and then transfer information to a computer. Record water pressure versus time for hydraulic troubleshooting of irrigation systems. Choice of standard pressure ranges including display reading resolution and overpressure rating for each range. 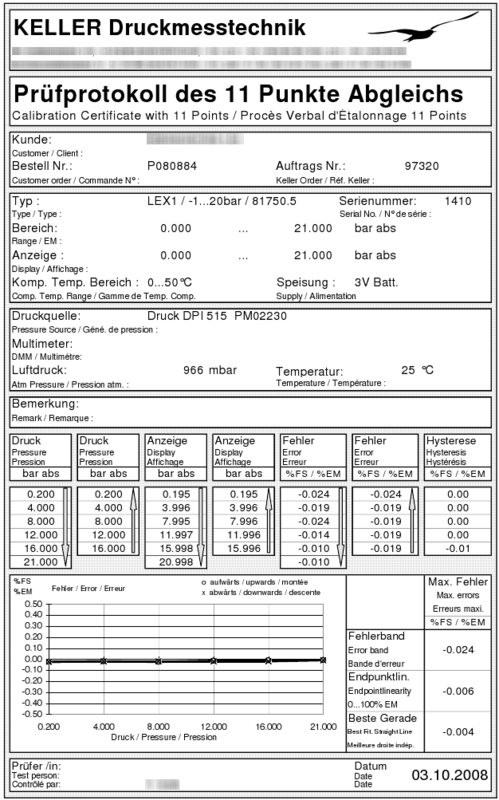 Specifications details common to all versions of the LEO Record pressure logger. This tutorial video explains how to use the logger software with the LEO Record pressure data logger. We’re looking at monitoring the pressure loss inside a chamber during a simple seal/pressure/hold/exhaust cycle, then repeating multiple times. We’d need to start logging data once the chamber has reached a set pressure, so that we could monitor and detect any leaks in the system. After a set period of time, the system will exhaust, we’d need to stop logging just before the exhaust phase. This cycle would then need repeating multiple times to life test the system and the seal. There are a few different logging modes to allow you to turn on/off logging related to pressure thresholds, so it should meet your needs. The minimum sample rate is 1 second and the memory stores up to 57,000 readings. How long does it take to fill the memory if you sample every second? The LEO Record can sample every second but the memory is limited to 57,000 readings, so it will fill the memory after ~15 hours and stop or start overwriting data depending on the configuration. Is it possible to program the LEO Record pressure logger to take a reading every second or even quicker? The minimum interval time between stored readings that can be selected is 1 second. Is it possible to leave the LEO Record pressure datalogger in situ for at least 24 hrs and record pressures every 10 seconds? Yes this is possible. The pressure logger can store up to 57,000 readings before the memory is overwritten or completes one cycle, depending on the chosen settings. If you record continuously over a 24 hour period with logging intervals of 10 seconds apart, you will store 8,640 readings. Is it possible to store data for multiple tests without connecting the LEO Record pressure logger to the PC to configure each test? The data is stored as one continuous data file with a date and timestamp for each measurement. Logging can be started and stopped via the front keypad, therefore you can easily separate the data for each set of test results by looking for a break in continuity in the date and timestamp. Is it possible to use the LEO Record pressure data-logger to log continuously for 4 weeks at 1 minute intervals? If you are just logging pressure (excluding temperature), the LEO Record will store ~ 28000 measured values. Over 4 weeks this would equal 1 reading every 86.4 seconds, so an interval of 2 minutes would be the recommended minimum interval to be on the safe side. We want to detect peak pressures above 16 bar with the LEO Record pressure logger fitted to a water pipe that is typically working at 4 to 8 bar. We need to record a pressure reading every second for a period of 7 days which is 604,800 readings and more than the capacity of the logger. Is it possible to only log when the pressure exceeds 16 bar and thus spread the memory capacity over the 7 days? When setting up the logging parameters within the logging software that is supplied with the LEO Record, it is possible to select a “Start Record at Event” mode which allows you to set a threshold pressure which would be 16 bar in this case. When the pressure exceeds 16 bar it is possible to increase the logging rate using the “Recording-Interval after Event” setting which in this case would be 1 second. In order to detect the event you will also need to set the “Event Detect Interval” to ensure the logger checks the pressure frequently enough to start logging in adequate time to capture the critical pressure readings. 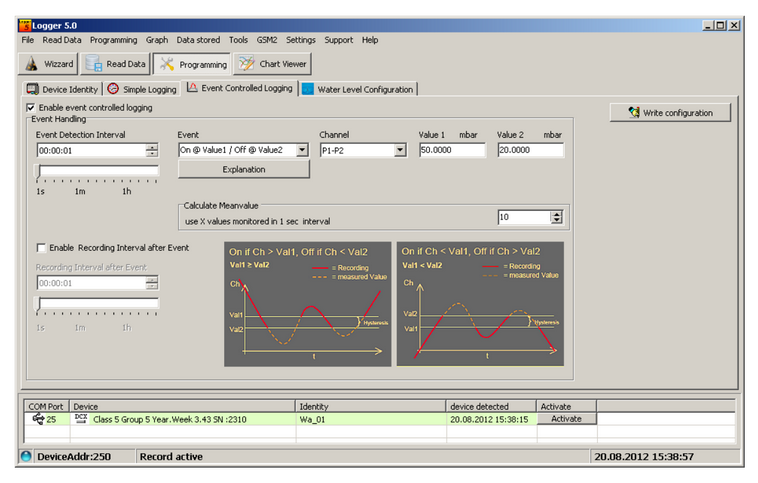 How do you set-up functions such as interval time for the LEO Record pressure data logger? 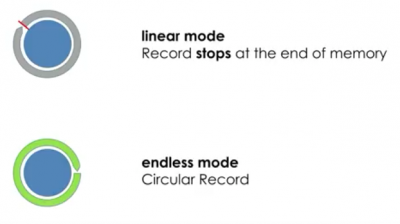 Since there is only a choice of record start (rec strt) and record stop (rec stop) via the display menu. Why does the memory capacity reduce if the time period between readings is greater than 15 seconds? For intervals of less than 15 seconds the interval time is stored together with the measured value. For longer intervals, the time is stored as a separate value and uses as much memory storage space as the measured value. Is it possible to order more data storage capacity for the LEO Record pressure data logger? I need 240,000 points of storage minimum. The maximum possible is 57,000 points storage for the LEO Record. We would suggest to consider using a IMP pressure sensor with the CMC-99 which is a universal data logger with the option for a 1.5GB internal memory which is plenty for storing 240,000 points or more. however unlike the battery powered LEO Record, the CMC99 requires external ac or dc power to operate. Is there a sensor plus logger like the LEO Record Pressure Data Logger which has a sampling rate of at least 5 Hz? The minimum interval is 1 second for the LEO Record, if using the internal memory to log. For logging at faster rates than 5 Hz (200 msec) we would suggest using the 33X digital pressure sensor and the Read30 software, with which you can log at a minimum rate of 30 msec (33Hz) with a baud rate setting of 9600, or 3 msec (333Hz) with a baud rate of 115,200. Is it possible to log with 1 minute intervals continuously for 7 days? The LEO Record can store up to 57,000 readings and the interval time can be adjusted from 1 sec…99 days, so there is more than enough memory capacity to log for 7 days with a 1 minute interval. I have a LEO Record pressure data logger and I am not sure what software I should be using with it to configure the logger to record pressure. Also which software should I use to retrieve and analyse the data? Is it possible to record a live feed of pressure readings from the LEO Record logging manometer to the data logging software on the PC? To record live readings directly to your computer you will need to use another application which you will find on the software CD that came with the logger. You can choose to install either the Control Center Series 30 (CCS30) or the older Read30 software. Is it possible to attach a custom name to each set of recorded test results stored in the LEO pressure logger memory?Record pressure logger memory? After the recorded data file is transferred to the PC, you can then use the provided Text Converter application software to change the name and export the file. Is it possible to connect the LEO Record pressure logger to a PC and record the values directly into the PC without using the internal memory of the logger? Yes the LEO Record can be connected to a PC via USB or RS232 interface to log continuously with the PC, thus allowing you to store more readings than the 57,000 readings it is possible to store in the internal memory. Do you have to pay for the LEO Record data logger software license? No, the software license is free and there is no limit on the number of PC computer installations. However there is a cost associated with the USB converter and cable which you will need to connect the LEO Record to a Windows PC. Does each LEO Record pressure data logger need it’s own data cable and software? No, you only need one data cable and software to download recorded data from any number of loggers. Is the software which comes with the leo record logger compatible with programs such as Excel for example? The data files that the logger software creates, can be converted to .txt file format with comma separated data, using the test converter application module. These .txt formatted files can be imported easily into other programs such as Excel. How do you go about clearing the memory of the leo record pressure logger? There is no delete function, instead the logger overwrites previous recorded readings once the memory is full. 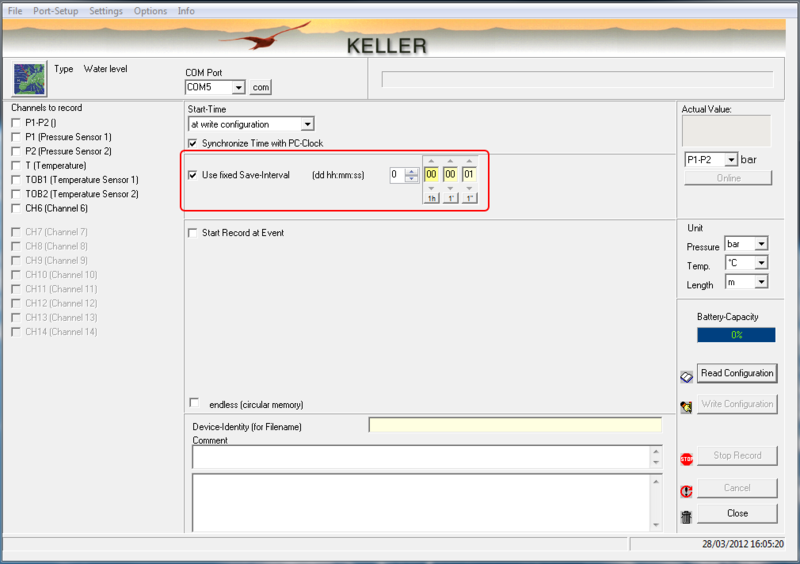 When setting up the “Write Configuration” in the PC logging software prior to sending instructions to the logger, there is the option to select/deselect a function called “Endless (circular memory)”. When you upload all the readings taken since the last upload, the memory will reset and overwrite for a full memory cycle. If “Endless” is selected, the logger will continue to overwrite the earliest recordings until the log is stopped. Endless selected – the logger will not stop once the memory is full, so if a log exceeds the memory capacity the readings taken at the beginning will be lost. Endless deselected – the log will stop if the memory capacity is exceeded, and therefore some of the readings at the end will be lost. How do we change the logging interval on the LEO Record pressure recorder from 1 per second to 1 per minute? The logger software package includes an application called “Writer” which has an option called “Use Fixed Save Interval”. Add a tick to the selection box and also tick the device channels to be included. Then select the interval you require in the time field (dd.hh.mm.ss). The maximal settable interval depends on the device version and is either 18 hours, 12 min, 15 sec, or 99 days, 23 hours, 59 min, 59 sec. Do I need to have the USB data cable that is available as an option with the LEO Record pressure logger? Unless you have purchased this previously, you will need this to be able to write instructions to the logger and retrieve stored data. You will only be able to use the LEO Record pressure logger as a digital pressure gauge without the USB data cable. In order to record data with the logger, you have to send instructions from the PC software, of the type of logging procedure you wish to conduct, such as how to start the log and the time interval. Also it is not possible to view the stored data on the logger display readout, so the data has to be uploaded to the PC in order to read and analyse the results. We are interested in the PC interface data logging pressure gauge called the LEO Record, we plan to use the product to assist in trouble shooting as well as to diagnose problems with hydraulic pumps and motor during repair. Are we able to use the data logging pressure gauge to produce a computer reading print out in addition to displaying the readings on the screen? We will be measuring up to 10,000 psi and the hydraulic pump testing will last 5 mins. It is possible to print out with the provided software, either a chart of the change in pressure over the duration of the test or just the data in tabulated form referencing date and time of each recorded point can be printed. The minimum recording interval is 1 second so over 5 minutes you will be able to collect 300 pressure readings. Will I be able to produce a report from the LEO Record logging manometer that our clients will accept as an accurate alternative to the round paper charts that we are accustomed to? We need to be able to produce a report for the client, that provides confidence that the document has not been falsified to make any tests look better than they actually are. It is not possible to alter the data stored inside the logger. A software CD is included with the USB converter cable option for the LEO Record. This CD includes logging software which enables the operator to upload the stored data (pressure, temperature, date and timestamp) to a PC without the risk of manual interference to the data. The data is then stored as a .idc extension file format for internal use by the provided PC logger software. 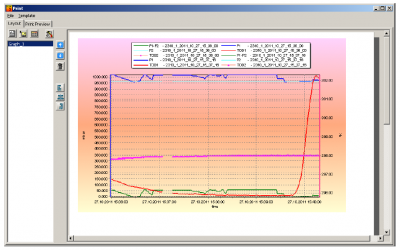 The recorded data can then be analysed and a table or graph printed out from the Viewer software module. The data can also be exported as .txt or .csv extension file format to easily open with spreadsheet program such as Microsoft Excel. The files are not encrypted, but like all computer files, it is possible to check the file properties and verify the creation date matches the modification date and thus verify data integrity. Is it possible to transfer logged data from the LEO Record pressure logger to a USB memory stick? After transferring the stored data from the logger to a PC via the software provided with the device, you can then save each set of logged data as a standard .txt format file which can then be transferred to any form of memory storage such as a USB memory stick. Do I need to purchase the USB converter and software for every LEO Record pressure logger that I purchase? No, you only need to buy one interface cable and software since it is universally compatible with any LEO Record logger, however if you have a large number of loggers it is recommended to own at least two interface cables so that one can be used as a spare in the case the other is damaged or is being used elsewhere. a) Although the time interval was set to 20msec, the data collected was separated by a 30 msec interval, why was there a 10msec difference? The read software program (Read30) can be set to read out every 20 milliseconds, but this is only the update rate of the PC-software. If the communication rate of the connected device is slower, the software will display a time stamp that is more than 20ms. The communication rate for the LEO Record is approx. 30 milliseconds. b) The pressure readings recorded were highly dynamic, but the same values were repeated over a period of 1 second. Is this a limitation of the LEO Record RS485 interface? The LEO Record itself measures pressure values every 1 second. If the pressure value is going to be read out via the USB converter cable at a faster rate, it will display the same value several times until the next updated value is released from the LEO Record. 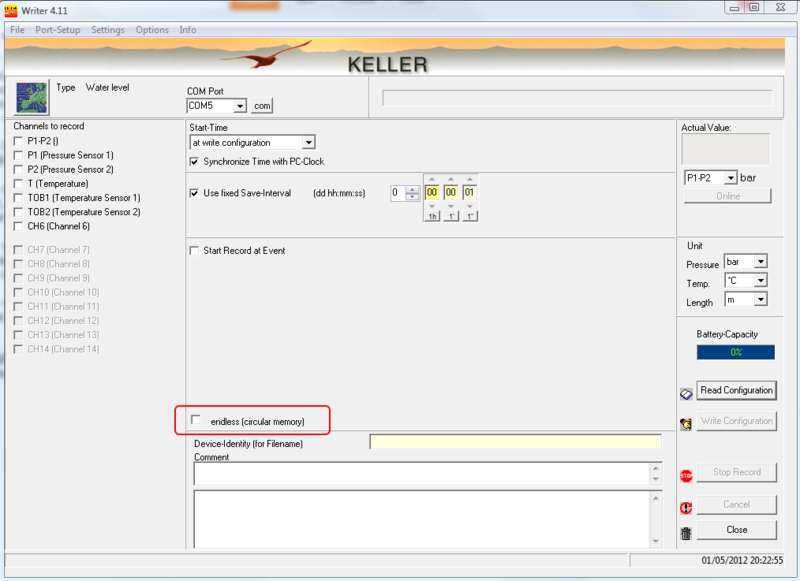 Our service technician has lost the disk for installing the Keller desktop logger software and we need to load the program onto another computer, where can we download it from the web? 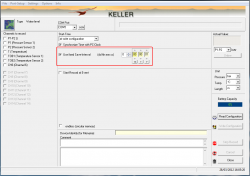 The logger software which is compatible with the LEO Record pressure logger and DCX-22 AA level logger can be downloaded for free from the Keller software download webpage. How is measurement data is exported, does it require MS Excel, or is it free of choice independent of what spreadsheet you use? Once the measurement data file is transferred from the LEO Record to the PC using the supplied software, it can then be converted to a .txt file, which you can then open with any spreadsheet program. What is the standard connection, since the 1/4 NPT male adapter is optional? 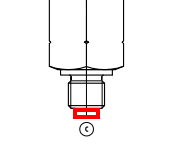 The standard process connector is a G1/4 male or 1/4 BSP P male thread. 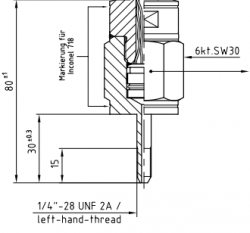 The optional BSP/NPT adapters can be fitted to the G1/4 male to easily convert the thread type. What process connection is fitted to the LEO Record logging pressure gauge? The standard process connection is G1/4 male (1/4 BSP male). A 1/4 NPT male adaptor is also available as an optional extra. For large quantity requirements it is also possible to provide custom pressure fittings instead of the standard 1/4 BSP male fitting. We have just received delivery of a LEO Record Pressure Data Logger. It has a G1/4 connection, we are attempting to connect it to a 1/4 NPT female, and I am trying to find a suitable coupling. Do you have any part information on this coupling? 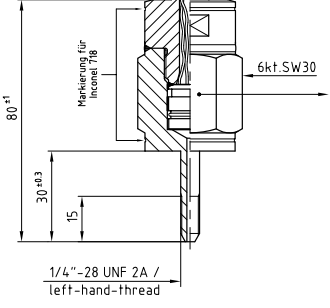 It is possible to order a G1/4 female to 1/4 NPT male adapter to convert the standard thread on the LEO Record. The part number is 506810.0037. Is the LEO record pressure logger available with a 1/4 NPT connection? Yes it is possible to specify an integrated 1/4 NPT male as a custom option, but there is an additional cost which will be applied, and the delivery will be based on the manufacturing time since there will be no stock held with this custom configuration. Is the LEO Record pressure logger suitable for working on temperatures in the range of -10°C to +50°C? The operating temperature range is 0 to 50 degC, the storage temperature range is -10 to +60 degC. The instrument should log at -10 degC but the LCD digital display may be affected and the accuracy cannot be guaranteed because the pressure accuracy of the logger is only tested over a compensated temperature range of 0 to 50 degC. Can the LEO Record pressure logger gauge be installed permanently in the field without any covering box? Yes the LEO Record can be installed outside and the environmental protection rating is IP65. The operating temperature range of the LEO pressure recorder is 0-50°C, can it be run when the ambient temperature of the circulated fluid is below 0°C down to a minimum ambient temperature of -10°C? The bottom metal threaded part of the pressure recorder is certainly capable of withstanding -10degC as long as no ice forms inside the pressure port, this could damage the diaphragm membrane due to the forces generated by the expansion of the ice inside the pressure connector. The storage temperature spec is -10degC so the instrument will not be damaged by taking the ambient temperature this low, however the pressure sensor inside is digitally compensated over the range of 0 to 50 degC, so the accuracy could be significantly out of spec if the process media is also below 0 degC. Also the operation of the LCD display may be affected if the ambient temperature is between 0 and -10 degC. I have a question about the operating temperature at which the LEO Record pressure datalogger can operate. We intend to use this logger to measure oil pressure up to a temperature of 130°F. The operating temperature mentioned on the data sheet is 50°C, what will happen if we use the logger at a higher temperature, do we risk damaging the gauges or will there be a slight error in pressure readings? The maximum storage temperature allowed for the LEO Record is +60 degC (+140 degF), so a 130 degF media or environment will not damage the logger. There will be an increased error in the reading accuracy if the temperature exceeds 122 degF, but it is hard to determine how much. This is because the logger is digitally compensated over the temperature range 0 to +50 degC (+32 to +122 degF), and therefore the measurement uncertainty is unknown at higher temperatures and not predictable. Since the difference in temperature between the pressure logger’s max temperature is only slightly lower than your maximum application temperature, you may find that the media temperature at the pressure connection is actually lower than the logger’s maximum temperature, especially if the ambient temperature is significantly lower than the process media temperature. Since there is a dead ended volume of process media trapped in the pressure connector, a differential temperature gradient will be created along the length of the pressure connector and any small diameter pipework connecting the logger to the process. The longer the length of the connecting pipes is, the greater the cooling effect will be on the logger. Are the replacement batteries for the leo record pressure gauge logger a special type or can they be purchased anywhere? Although the battery cell is available elsewhere it is incorporated into a plastic case assembly and connection wires are soldered to the electrical terminals, so it should only be sourced via a supplier of the logger. The part number for the battery assembly is 557005.0006. What is the operational lifetime of the battery inside the leo record pressure logging gauge? The battery is estimated to last for 5 years if recording at a rate of 1 reading/10secs or 2 years of you are recording at a rate of 1 reading/sec. If the battery is removed from the LEO Record pressure data-logger, will the data stored in the memory be lost? The memory is non-volatile so it will be retained if the battery is removed. I have noticed a date marked on the battery used in the LEO Record pressure recorder, is this a use by date? No, the date marked on the body of the Lithium battery is the manufacturing date. I need a copy of the MSDS for the Lithium metal batteries used inside the LEO Record Ei pressure logger? Is the 30 bar range LEO Record pressure logger compatible with water? The process connection is compatible with most types of water, it has an all stainless steel 316L pressure port and diaphragm with viton seals. What are the construction materials exposed to the process media on the leo record pressure gauge logger? We are interested in the LEO record pressure logger, we are looking to measure pressure in a line containing Crude oil and Xylene, is the instrument compatible? The parts in contact with the media are a pressure port and a thin isolation diaphragm which are both made from Stainless Steel 316L and a Viton O ring seal. Sweet or Sour Crude oil has excellent compatibility with both stainless steel 316 and Viton. The compatibility with Xylene is also excellent for stainless steel 316 and good for Viton. Is the silicone oil used to fill behind the isolation diaphragm suitable for hygienic/food applications? As standard the pressure sensor capsule is filled with a small quantity of AK100 silicone oil which is FDA approved for use with food processing equipment. Is the LEO Record pressure logger suitable for operation in hazardous environments? There is a ATEX approved intrinsically safe version which is suitable for use in hazardous environments, and the ATEX approval coding for the LEO Record is as follows: II 2 G EEx ia IIC T4. The instrument is battery powered and can be used inside the hazardous area. However, in order to upload the stored results the instrument will have to be taken to a safe area away from the hazardous environment when connecting the logger directly to a PC computer. Which hazardous area zone can the LEO Record pressure recorder be used in? The highest class of hazardous area in which the instrument can be used is zone 1. The complete ATEX certificate markings are II 2 G EEx ia IIC T4. Also note that the digital communications can only be used when the instrument is moved to a safe area. Can the USB or RS232 interface which is used with the LEO Record Ei pressure datalogger be used in a hazardous area? No, only the logger can be used in intrinsically safe areas. The data can be collected in the hazardous area inside the logger and then it has to be removed to a safe area to upload the data to a PC. What does the warning “safe area use only” which is mentioned alongside the USB data cable option for the LEO Record pressure data-logger? Since the ATEX approved version of the LEO Record can be used in potentially explosive atmosphere environments such as an oil refinery or a pharmaceutical factory, the statement “safe area use only” is a warning that that applicable component, in this case the USB data cable, is not approved for use in the hazardous zone. In order to upload the logged data, the logger must be removed from the hazardous area and connected to the PC via the USB cable in a “safe area” such as the onsite instrument workshop. Can the LEO Record be used in an explosive atmosphere environment, does it have an internal battery and can it display in psi pressure units? We would suggest the LEO Record Ei which is the ATEX approved version. The logger is battery powered and can be easily setup to read in psi (pounds per square inch) units. 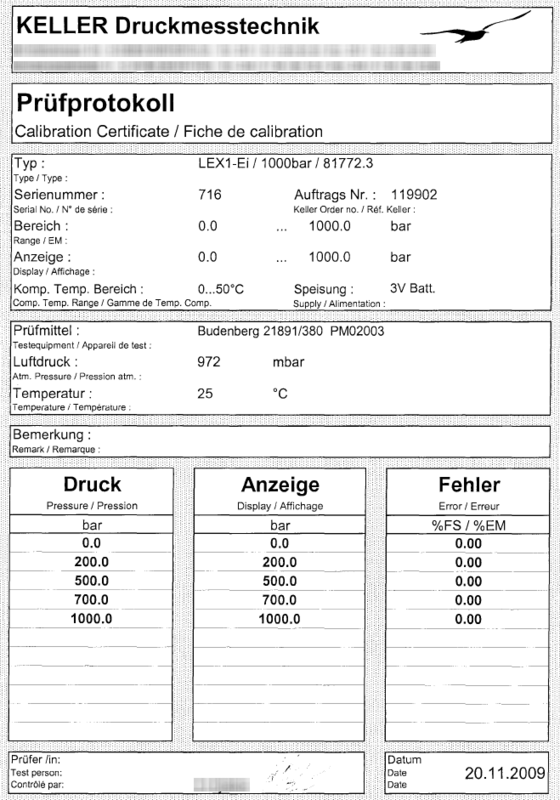 What does 5 point traceable calibration certificate mean? It is a document for verifying accuracy for ISO9000 quality assurance purposes, which shows reference pressure against actual displayed reading, 3 points as the pressure is increased, and 2 points as the pressure is decreased. I need a certified calibration for the LEO Record pressure logger, what type of calibration options are offered with this instrument? What exactly is the 5 pt. & 11 pt. calibration option for the LEO Record digital manometer? 5 points – 5 different points, equally spaced, are checked in the positive direction, over the pressure range from zero to full scale. 11 points – 6 different points, equally spaced, are checked in the positive direction, and 5 points are repeated in the negative direction, over the pressure range from zero to full scale and back again to zero. What does UKAS, traceable 5 and 11 points refer to on the calibration certificate options for the LEO pressure datalogger? You can have 5 or 11 separate pressure points recorded on the calibration certificate, equally spaced apart over the pressure range. Traceable means that the calibration equipment type and serial number is noted on the cal cert so that the claimed calibrated accuracy can be traced back to international standards if necessary. UKAS is a higher level traceable calibration where the device is calibrated in an actual UKAS accredited laboratory by an accredited calibration technician. Most of our equipment needs to be returned for re-calibration every 12 months, would we need to return the leo record logging pressure gauge yearly to the supplier for re-calibration or could we use a more local calibration service to us? 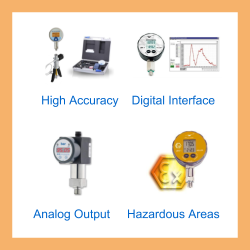 The calibration would need to be one that is industry recognized as the equipment tested with the gauge is classed as well control/integrity equipment. So it would need to be the highest spec calibration that can be supplied. You can send the LEO Record to be re-calibrated every 12 months to any local claibration laboratory. In the UK, UKAS is the highest recognised standard for pressure calibration, and there are many UKAS accredited calibration laboratories located around the United Kingdom. How accurate are the pressure readings for the 30 bar range leo record logger? Based on the standard 0.1% full scale over 0 to 50°C, the accuracy of a 30 bar range will be +/- 30 mbar at any pressure value or temperature between 0 and 50 degC. Also you will need to add the resolution of the reading, which is 10 mbar for the display or 0.6 mbar if reading from stored data. What accuracy would we get from a LEO Record pressure gauge logger with a -1 to 30 bar range at lower pressures such as 1 Bar? The instrument accuracy is 0.1 % full scale, so a 30 bar range will be accurate to within 3% of 1 bar, so the maximum error uncertainty would be 30 mbar. What is the resolution of the recorded data for the LEO pressure recorder, is it the same as the display resolution or better? The LEO Record has a 16 bit microprocessor and other components such as the memory and analogue to digital converter reduce the real measurement resolution to 1 in 50,000 or 20 ppm. So for example a 700bar range logger will have a resolution of approximately 14mbar for the stored data, which is better than the displayed reading resolution of 100mbar. The LEO Record pressure logger accuracy quoted on the data sheet is 0.1% over 0 to 50 degC which is the same as new LEO5 high resolution manometer and logger. 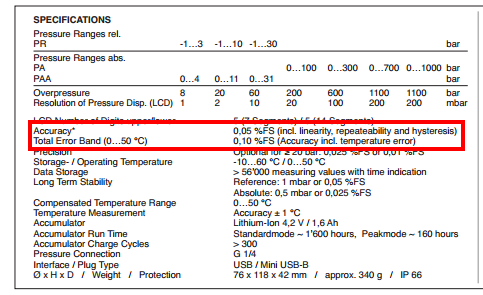 But the LEO5 data sheet also includes 0.05% FS for linearity, repeatability and hysteresis at room temperature, so does the LEO Record also have this accuracy at room temperature, since it is not mentioned anywhere on the data sheet? Yes, the accuracy spec for both is the same, it will probably be added when the LEO Record data sheet is next updated. What is the maximum pressure containment rating for a 4 bar absolute leo record? The burst pressure is in excess of 200 bar, the rating is defined by the glass feed through header on the backside of the internal sensor, the safe pressure for the header weld is 200 bar. The safe overpressure of 10 bar is the maximum pressure that gauge can withstand and still function normally afterwards, without any damage. If the pressure goes above 10 bar, then it may damage the sensor, and it will not function afterwards, but the pressure will be continue to be contained up to 200 bar. Is it possible to have a pressure range of -0.1 to + 0.1 bar for the LEO Record Pressure Data Logger ATEX Version? Yes the Capo version of the LEO Record has a bidirectional -100 to +100 mbar range and also has the option for ATEX approval. We are using 1500 bar hydraulic tensioner pumps and would like to know the data logging possibilities with the LEO Record. We want to register the pressures, and if possible with a simple solution for using this gauge with USB connection to transfer the registered readings. It is possible to specify a 1500 bar range for the LEO Record, with an overpressure limit of 1650 bar. The pressure connection is slightly different to the standard as well, since it does not come with a seal around the thread, so it is left to the installer to decide what to use. Ideally a copper seal or other suitable metal seal should be used at these high pressure, preferably sealed on the flat surface at the front end of the thread rather than around the thread at the back end of he thread. Alternatively it is possible to supply the logger with a high pressure Autoclave 1/4″-28 UNF 2A male left hand thread if preferred. Is the -1 to 3 bar range LEO Record pressure logger a psig or psia pressure range? A standard LEO Record with a -1 to 3 bar range is an absolute range. So if the pressure units are changed to psi via the menu display keys it will measure in psia. It is also possible to measure in psig (sealed gauge reference type) by using the built-in zero tare function, although if you are using the gauge over a long period of time you will need to regularly vent the logger to compensate for atmospheric changes since the gauge reference is not vented. Is it possible to change the displayed values of the LEO Record pressure logger between absolute and relative pressure depending on the application needs? The pressure sensor used inside this logger has an absolute reference, but you can zero the displayed reading when vented to atmosphere, and then read the relative pressure. Since there is no physical relative reference port, you will need to check the zero at regular intervals to remove any offset due to atmospheric changes. The size of the offset effect due to atmospheric changes will depend on the pressure range of the pressure logger. e.g. a 10 mbar change in atmospheric pressure will result in a 0.033% offset for a 31 bar range and 0.0033% offset for a 300 bar range, the latter being much smaller than the overall logger accuracy of 0.1%. Does the LEO Record have a working pressure of at least 10 000 psi? One of the standard pressure ranges is 700 bar which is slightly more than 10,000psi. If required there is a higher range of 0-1000 bar (~14,500psi). Are the readings produced by the barometric version of the LEO Record pressure data logger the same as the readings used for weather reporting? No, the LEO Record measures the actual atmospheric pressure only. A weather station will measure the actual atmospheric pressure and then correct it digitally for altitude to display the equivalent meteorological reading at mean sea level. Is possible to select psi or bar to be displayed the display of the LEO Record? The units bar or psi can be selected to display on the built-in LCD display. It is possible to provide the pressure reading on the display in bar, mbar/hPa, kPa, MPa, psi, kg/cm2 or mH2O. Is it possible to program the logger to use any pressure unit? The PC software allows you to configure any pressure units for displaying the results in a spreadsheet, graph or printout. Is it possible to read pressure in psi with the LEO record pressure recorder? The logger itself has a digital display which can be configured to read in pounds per square inch (psi) if required via a few presses of the front panel menu buttons. 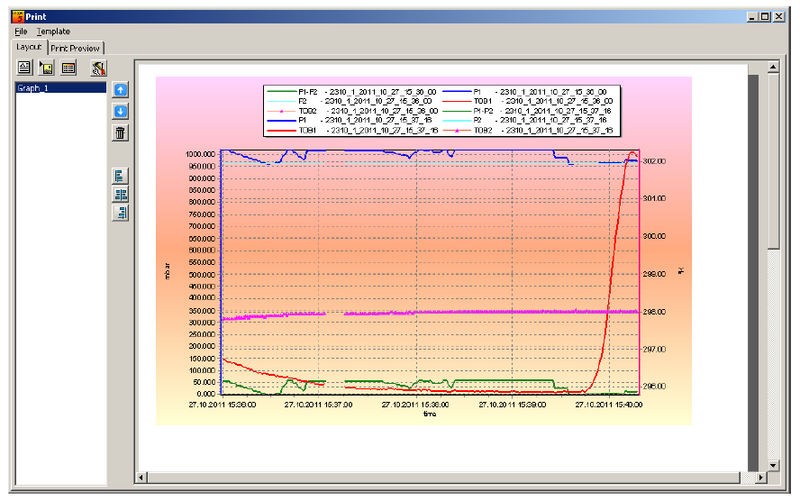 It is also possible to read psi pressure units when using the PC software to analyse recorded data. Is it possible to configure the LEO record pressure logger so that it always displays in ‘psi’ pressure units even when the battery is replaced? Currently the instrument reverts to the default ‘bar’ units when the battery is replaced or disconnected. Yes, it is possible to re-configure the firmware during manufacture so that the LEO Record will only display in one pressure unit such as the requested ‘psi’. However this modification will prevent the user from accessing the choice of engineering units normally available with the standard configuration. Can the LEO Record pressure datalogger measure temperature? Yes you can record both pressure and temperature at the same time although you can only display the pressure reading on the front panel display. The temperature is measured behind the diaphragm, so the temperature sensor is not in direct contact with the media and therefore will be less responsive to highly dynamic changes in temperature of the media. How does the LEO Record pressure data logger measure temperature and where is it displayed? Since it is not shown on the logger display on the product data sheet. The temperature reading is not the primary function of the instrument, the LEO Record utilises an internal sensor mounted close to the pressure sensor so that it is in close proximity to the process temperature but not in direct contact with the process. The temperature readings cannot be displayed on the logger LCD screen, and it is only possible to record the temperature readings in the internal memory of the logger and upload then to a PC for analysis. When configuring the logger via the PC to record pressure you can select whether or not to record temperatures, since there may be occasions where you need more memory capacity to record all the pressure points, and turning off temperature logging will double the available storage space. Over what temperature range is it possible to measure temperature with the LEO Record in its standard configuration? This pressure logger is compensated over the temperature range 0 to 50°C, so only readings over this range should be relied on to be within an accuracy of 0.5 degC. What is the main function of the protective rubber covering which is an option on the LEO Record pressure recorder? To limit the damage to the logger from accidental impact, whilst being moved around, or some object colliding with the instrument once installed. We have a LEO recorder Ei/700bar/81730.2 digtal gauge, the rear housing is cracked and we wondered if it was possible to source a replacement part? Unfortunately it is not possible to provide spare parts for this product, only accessories such as spare battery etc.. Also the LEO Record Ei is an ATEX approved version, and therefore it should only be repaired by a manufacturer approved repairer. I’d like a battery powered pressure logger to record water pressure in a pumped main where the peak pressure will be no more than 5 bar? We would suggest a 10 bar range LEO Record for monitoring pumped water main pressure. We have a logging application for vacuum bags used in the composites processing industry. The range is 0 to -1 bar. The components are placed under a vacuum bag to apply compression up to atmospheric pressure. I would like to measure the variation of applied vacuum and the rate of vacuum application. I would like to to plot the recorded data as a graph against time in a spreadsheet? The -1 to 3 bar vented gauge range Keller LEO Record can be used to measure vacuum as a negative pressure over the 0 to -1 bar range required. All recorded readings are data and time stamped so you can calculate the rate of vacuum applied when transferring the data to a spreadsheet to plot a graph. I am looking for a pressure logger that can record pressure decay over a period of around 5 minutes from 1 bar down to 0 bar. I would like this so the data can be exported so a graph can be produced from the pressure decay for each experiment. Could you let me know if this is possible firstly, and then if I would need to export the data for each experiment or if it will save each one? Also I assume these can be connected straight into a pressure line? You can log data at a rate of 1 reading per second or slower, so you can have plenty of data points to plot over a period of 5 minutes. You can start and stop logging as many time as you like until the memory is full and then upload each set of results to the computer where you can export to text files to import into spreadsheets. The process fitting is G1/4 male thread (1/4 BSP P male) so you will need a G1/4 female connection on the pipe to fit the logger, with sufficient flat surface around the outside of the threaded hole to make a pressure seal using the viton o ring seal attached to the male fitting. Our intention is to record compressed air pressure up to 150 psi or 10 bar continuously throughout the day . the aim will be to identify any variation in pressure over the course of the day. The data will need to be retractable at the end of the day for analyzing on a computer. A LEO Record with a 10 bar range will measure in bar or psi, and has sufficient memory to comfortably record a days worth of readings if the sample rate is set to 1 reading every 5 seconds. We need equipment which will be used for Laboratory work in the paper industry for monitoring the vacuum range with a time step of maximum 1 second, and a maximum measurement duration of 2 Minutes. We would need to export the saved readings file to Excel for reporting. The minimum logging interval is 1 second and there is plenty of memory for storing 120 readings. You will also be able to convert the stored data files to a .txt file format with the supplied PC software, which can then be opened by any spreadsheet program. We require to be able to record pressure fluctuations in HDPE pipework 50mm diameter and 600m long. We need to be able to read the data in table or graphical form. We plan to fill the system with water and pressurize to 10bar with the data logger connected, and then seal off and record the pressure degradation over 48hours. We would suggest using a 11 bar absolute/-1 to 10 bar sealed gauge range LEO Record with a logging interval of 5-10 seconds, which will ensure the memory capacity is not exceeded over a 48 hour logging period. I want to record the pressure of incoming mains water supply into a building to prove issues with high pressures. I require to monitor the water pressure across a 24hour period. The LEO Record can store up 57,000 readings, therefore you could record the water pressure at a rate of 1 reading every 5 seconds without overfilling the memory. What LEO Record would I use to record in 15 to 30 minute pressure drops with a max pressure of 15 psi/1 bar, and possibly an ATEX version at the same pressure and recording time? I need a 0 to 700 bar range data recording pressure gauge complete with software and usb lead to down load the recorded information to a PC running Windows 7 Professional? I am pressure testing a junction box housing to 1.38bar, and need to log the data over a time period to ensure that there is no pressure loss. The following LEO Record spec would be suitable, as well as measuring pressure, you can also record temperature to eliminate any pressure changes due to adiabatic effects. Once the data is transferred to the PC, you can plot a graph using the supplied software to detect whether there has been any pressure loss. We are looking for an ATEX intrinsically safe logger for measuring air pressures up to 30 psi, with a 1/4″ NPT male fitting to monitor 3 to 15 psi signal to control valves. We would suggest a -1 to 3 bar range LEO Record Ei which is ATEX approved, and is capable of displaying & recording pressure in psi units. The standard 1/4 BSP male fitting can be converted to 1/4 NPT male with the use of a supplied adapter. I am looking to log pressure fluctuations across various sections of our LP air distribution system, operating pressure is 6.5 to 7.5 bar. We would suggest the following specification for the LEO Record for logging pressure fluctuations. I require a solution to record events of local low mains water pressure on lines feeding vending equipment. We have sites that we believe are prone to periodic low water pressure and flow leading to interruption of service. The environments are office and industrial premises. The pressure range we need to measure is 0-3bar. We would suggest the standard -1 to 3 bar pressure range, and to conserve datalogger memory, you could set a event based logging procedure so that measurements are only recorded when the pressure drops below a threshold point. We are looking for a digital gauge which includes a function for recording pressure and possibly temperature data. The gauge should have an interface so an interconnecting USB cable can interface between the gauge and a standard laptop with windows operating system. In addition to pressure the LEO Record also measures temperature. The sensor is located behind the diaphragm so it does not provide a direct reading, but it is fairly close to the media being measured. A USB converter box & software is available as a standard option for transferring data to a Windows computer. We have a scientific instrument which uses compressed air at 4 bar g delivered from a compressor at 8 bar g. We are experiencing fluctuations which can cause the instrument to stop if the pressure goes below 4 bar g. We need to log these fluctuations to find the cause of the fault. We would suggest a -1 to 10 bar gauge range LEO Record to measure this as long as the minimum cycle period of the fluctuations is much greater than a few seconds and the amplitude is greater than 10 mbar. Does the kit have everything needed for standalone measurement? 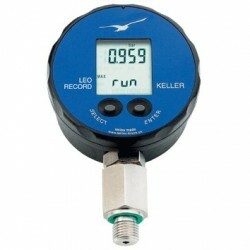 Yes, the LEO Record combines a pressure, digital indicator, logging memory and battery in one package. Please select the options you require for the LEO Record (Ei) Pressure Data Logger in your application and request a quote. Send us your enquiry for LEO Record (Ei) Pressure Data Logger to get assistance with this product type.